Initially, Jung had aspirations of becoming a preacher or minister in his early life. There was a strong moral sense in his household and several of his family members were clergymen as well. After studying philosophy in his teens, Jung decided against the path of religious traditionalism and decided instead to pursue psychiatry and medicine. His interest was immediately captured—it combined the biological and the spiritual, exactly what he was searching for. 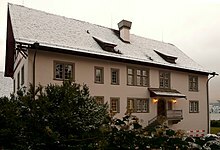 In 1895 Jung began to study medicine at the University of Basel. Barely a year later in 1896, his father Paul died and left the family near destitute. They were helped out by relatives who also contributed to Jung's studies. During his student days, he entertained his contemporaries with the family legend, that his paternal grandfather was the illegitimate son of Goethe and his German great-grandmother, Sophie Ziegler. In later life, he pulled back from this tale, saying only that Sophie was a friend of Goethe's niece. In 1912 these tensions came to a peak because Jung felt severely slighted after Freud visited his colleague Ludwig Binswanger in Kreuzlingen without paying him a visit in nearby Zurich, an incident Jung referred to as "the Kreuzlingen gesture". Shortly thereafter, Jung again traveled to the United States and gave the Fordham University lectures, a six-week series, which were published later in the year as Psychology of the Unconscious: a study of the transformations and symbolisms of the libido, (subsequently republished as Symbols of Transformation). While they contain some remarks on Jung's dissenting view on the libido, they represent largely a "psychoanalytical Jung" and not the theory of analytical psychology, for which he became famous in the following decades. Nonetheless it was their publication which, Jung declared, “cost me my friendship with Freud”. 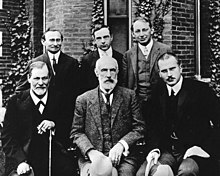 During the period of Jung's collaboration with Freud, both visited the US in 1909 to lecture at Clark University, Worcester, Massachusetts where both were awarded honorary degrees. In 1912 Jung gave a series of lectures at Fordham University, New York which were published later in the year as Psychology of the Unconscious. Jung made a more extensive trip westward in the winter of 1924–5, financed and organized by Fowler McCormick and George Porter. Of particular value to Jung was a visit with Chief Mountain Lake of the Taos Pueblo near Taos, New Mexico. 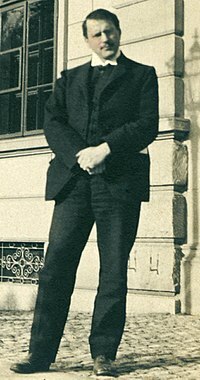 Jung made another trip to America in 1936, giving lectures in New York and New England for his growing group of American followers. He returned in 1937 to deliver the Terry Lectures at Yale University, later published as Psychology and Religion. Jung's thought was formed by early family influences, which on the maternal side were a blend of interest in the occult and in solid reformed academic theology. On his father's side were two important figures, his grandfather the physician and academic scientist, Karl Gustav Jung and the family's actual connection with Lotte Kestner, the niece of the German polymath, Johann Wolfgang Goethe' s "Löttchen". Although he was a practicing clinician and writer and as such founded analytical psychology, much of his life's work was spent exploring related areas such as physics, vitalism, Eastern and Western philosophy, alchemy, astrology, and sociology, as well as literature and the arts. Jung's interest in philosophy and the occult led many to view him as a mystic, although his preference was to be seen as a man of science. During the 1930s, Jung had worked to protect Jewish psychologists from antisemitic legislation enacted by the Nazis. Jung's individual efforts to aid persecuted German-Jewish psychologists were known only to a few; however, during this period he discreetly helped a large number of Jewish colleagues with active and personal support in their efforts to escape the Nazi regime - and many of those he helped in this period would later become friends of his. In his novel The World is Made of Glass (1983) Morris West gives a fictional account of one of Jung's cases, placing the events in 1913. As stated in the author's note, the novel is "based upon a case recorded, very briefly, by Carl Gustav Jung in his autobiographical work Memories, Dreams, Reflections". Musician David Bowie described himself as Jungian in his relationship to dreams and the unconscious. Bowie sang of Jung on his album Aladdin Sane (a word play on sanity) and attended the exhibition of The Red Book in New York with artist Tony Oursler, who described Bowie as "... reading and speaking of the psychoanalyst with passion". Bowie's 1967 song "Shadow Man" poetically encapsulates a key Jungian concept, while in 1987 Bowie tellingly described the Glass Spiders of Never Let Me Down as Jungian mother figures around which he not only anchored a worldwide tour, but also created an enormous onstage effigy. Argentinian musician Luis Alberto Spinetta was influenced by the texts of Carl Jung in the development of his 1975 conceptual album Durazno sangrando, specifically in the songs "Encadenado al ánima" and "En una lejana playa del ánimus", which deal with the jungian concepts of Anima and Animus. Jung appeared on the front cover of The Beatles Sgt. Pepper's Lonely Hearts Club Band. BTS's 2019 album Map of the Soul: Persona is based on Jung's Map of the Soul, which gives basic principles of Jung's analytical psychology. The album includes an intro song titled Persona rapped by group leader RM, who asks the question 'who am I? ', and is confronted with various versions of himself with words such as "Persona", "Shadow", and "Ego", which refer to Jung's theories. The Persona series of games is heavily based on his theories, as is the Nights into Dreams series of games. ^ As a university student Jung changed the modernized spelling of Karl to the original family form of Carl. Bair, Deirdre (2003). Jung: A Biography. New York: Back Bay Books. pp. 7, 53. ISBN 978-0-316-15938-8. ^ 'For Jung, alchemy is not only part of the pre-history of chemistry, that is, not only laboratory work, but also an essential part of the history of psychology as the history of the discovery of the deep structure of the psyche and its unconscious. Jung emphasized the significance of the symbolic structure of alchemical texts, a structure that is understood as a way independent of laboratory research, as a structure per se.' Calian, George Florin (2010). Alkimia Operativa and Alkimia Speculativa. Some Modern Controversies on the Historiography of Alchemy. Budapest: Annual of Medieval Studies at CEU. pp. 167–168. ^ C. G. Jung, Die Beziehungen zwishen dem Ich und dem Unbewußten, chapter one, second section, 1928. Also, C. G. Jung, Aufsatze zur Zeitgeschichte, 1946. Speeches made in 1933, 1937 are excerpted. He was protesting the "slavery by the government" and the "chaos and insanity" of the mob, because of the very fact that they were the part of the mob and were under its strong influence. He wrote that because of the speeches he delivered he was blacklisted by the Nazis. They eliminated his writings. ^ A full response from Jung discounting the rumors can be found in C. G Jung Speaking, Interviews and Encounters, Princeton University Press, 1977. ^ a b Polly Young-Eisendrath. The Cambridge Companion To Jung. Cambridge University, 2010. pp. 24–30. ^ McBride, Jason (2017). "The Pronoun Warrior". Toronto Life. ^ Eileen Rizo-Patron, Edward S. Casey, Jason M. Wirth (eds. ), Adventures in Phenomenology: Gaston Bachelard, SUNY Press, 2017, p. 123 n. 11. ^ "Jung". Random House Webster's Unabridged Dictionary. ^ Wehr, Gerhard (1987). Jung: A Biography. Boston/Shaftesbury, Dorset: Shambhala. p. 9. ISBN 978-0-87773-455-0. ^ Brome, Vincent (1978). Jung (1 ed.). New York: Atheneum. p. 28. ^ Wehr, Gerhard (1987). Jung: A Biography. Boston/Shaftesbury, Dorset: Shambhala. pp. 17–19. ISBN 978-0-87773-455-0. ^ a b Memories, Dreams, Reflections. p. 18. ^ Dunne, Claire (2002). Carl Jung: Wounded Healer of the Soul: An Illustrated Biography. Continuum. p. 5. ^ Memories, Dreams, Reflections, p. 8. ^ Hoerni, Fischer & Kaufmann 2019, p. 233. ^ Wehr, Gerhard (1987). Jung: A Biography. Boston/Shaftesbury, Dorset: Shambhala. p. 349. ISBN 978-0-87773-455-0. ^ Stepp, G. "Carl Jung: Forever Jung". Vision Journal. Retrieved 19 December 2011. ^ Wehr records that Paul Jung's chosen career path was to achieve a doctorate in philology. He was an Arabist; but the family money ran out for his studies. Relief came from a family legacy, however, a condition of the will was that it should only be offered to a family member who intended to study theology and become a pastor. Paul Jung therefore had his career determined by a will, not his will. See page 20. ^ a b c Malchiodi, Cathy A. (2006). The Art Therapy Sourcebook. McGraw-Hill Professional. p. 134. ISBN 978-0-07-146827-5. ^ "Carl Jung | Biography, Theory, & Facts". Encyclopædia Britannica. Retrieved 19 July 2017. ^ Memories, Dreams, Reflections. p. 30. ^ Memories, Dreams, Reflections. p. 32. ^ "Carl Jung | Biography, Theory, & Facts". Encyclopedia Britannica. Retrieved 9 April 2019. ^ Wehr, G. p. 57. ^ Wehr, Gerhard (1987). Jung: A Biography. Boston/Shaftesbury, Dorset: Shambhala. p. 14. ISBN 978-0-87773-455-0. ^ Hoerni, Fischer & Kaufmann 2019, pp. 234, 259. ^ a b McGuire, William (1979). The Freud/Jung Letters. Picador. pp. 12–13. ISBN 978-0330258913. ^ Hoerni, Fischer & Kaufmann 2019, p. 259. ^ a b Hayman, Ronald (2001). A Life of Jung (1st American ed.). New York: W.W. Norton & Co. ISBN 978-0-393-01967-4. ^ Hoerni, Fischer & Kaufmann 2019, p. 234. ^ "C. G. JUNG: Experiences". IWC Schaffhausen. Retrieved 7 September 2015. ^ Hayman, Ronald (2001). A Life of Jung (1st American ed.). New York: W.W. Norton & Co. pp. 84–5, 92, 98–9, 102–7, 121, 123, 111, 134–7, 138–9, 145, 147, 152, 176, 177, 184, 185, 186, 189, 194, 213–4. ISBN 978-0-393-01967-4. ^ Hayman, Ronald (2001). A Life of Jung (1st American ed.). New York: W.W. Norton & Co. pp. 184–8, 189, 244, 261, 262. ISBN 978-0-393-01967-4. ^ Crowley, Vivianne (1999). Jung: A Journey of Transformation. Quest Books. p. 56. ISBN 978-0-8356-0782-7. ^ Hoerni, Fischer & Kaufmann 2019, p. 260. ^ Peter Gay, Freud: A life for Our Time (London, 1988) p. 202. ^ a b Rosenzwieg, Saul (1992). Freud, Jung and Hall the King-Maker. ISBN 978-0-88937-110-1. ^ Makari, George (2008). Revolution in Mind: The Creation of Psychoanalysis. Duckworth. p. 249. ISBN 9780715637593. ^ Jung, Carl (1963). Memories, Dreams, Reflections. Pantheon Books. p. 206. ^ Carlson, Heth (2010). Psychology: The Science of Behavior. Upper Saddle River, NJ: Pearson. p. 434. ISBN 978-0-205-64524-4. ^ Gay, Peter (2006). Freud: A Life for Our Time. Norton. p. 225. ^ Mary Williams, “The Indivisibility of the Personal and Collective Unconscious”, Journal of Analytical Psychology 8.1, January 1963. See also: Jung, Collected Works vol. 9.I (1959), "The Concept of the Collective Unconscious" (1936), ¶91 (p. 43). ^ Vernon, Mark (6 June 2011). "Carl Jung, part 2: A troubled relationship with Freud – and the Nazis". The Guardian. ISSN 0261-3077. Retrieved 19 July 2017. ^ Addison, Ann (2009). "Jung, vitalism and the psychoid: an historical reconstruction". 54, no.1. Journal of Analytical Psychology: 123. ^ Jones, Ernest, ed. Lionel Trilling and Steven Marcus. The Life and Work of Sigmund Freud, New York: Anchor Books, 1963. ^ a b Vernon, Mark (6 June 2011). "Carl Jung, part 2: A troubled relationship with Freud – and the Nazis". The Guardian. Retrieved 7 June 2015. ^ McGuire, William. (1995), 'Firm Affinities: Jung's relations with Britain and the United States' in Journal of analytical Psychology, 40, p. 301-326. ^ Jung, C. G. (1916). Collected Papers on Analytical Psychology. Dr. Constance E. Long. Bailliere, Tindall and Cox. ^ a b c Corbett, Sara (16 September 2009). "The Holy Grail of the Unconscious". The New York Times. Retrieved 20 September 2009. ^ a b "The Red Book of C. G. Jung". Rubin Museum of Art. Archived from the original on 11 July 2009. Retrieved 20 September 2009. ^ a b McGuire, William (1995). "Firm Affinities: Jung's relations with Britain and the United States". Journal of Analytical Psychology. 40 (3): 301–326. doi:10.1111/j.1465-5922.1995.00301.x. ^ Hoerni, Fischer & Kaufmann 2019, p. 261. ^ Jung, Carl (1988). Psychology and Western Religion. Ark Routledge. p. v. ISBN 978-0744800913. A third and equally weighty essay is Psychology and Religion, originally given as the Terry Lectures at Yale University in 1937. Editorial Note by William McGuire. ^ Duvall, John N. (2008). Race and White Identity in Southern Fiction: From Faulkner to Morrison. Palgrave Macmillan. p. 165. ISBN 9780230611825. ^ Burleson, Blake W. (2005). Jung in Africa. ISBN 978-0-8264-6921-2. ^ Bair, Deirdre (2003). Jung: A Biography. pp. 417–430. ISBN 978-0-316-07665-4. ^ a b Hoerni, Fischer & Kaufmann 2019, p. 262. ^ The Collected Works of C. G. Jung, p. 152, by Siegfried M. Clemens, Carl Gustav Jung, 1978. ^ In Psychology and Religion, v.11, Collected Works of C. G. Jung, Princeton. It was first published as Antwort auf Hiob, Zurich, 1952 and translated into English in 1954, in London. ^ Bair, Deirdre (2003). Jung. Boston: Little, Brown. pp. 622–3. ISBN 978-0-316-07665-4. ^ "Dr. Carl G. Jung is Dead at 85; Pioneer in Analytic Psychology". ^ Lachman, Gary (2010). Jung the Mystic. New York: Tarcher/Penguin. p. 258. ISBN 978-1-58542-792-5. ^ Dicks-Mireaux, M. J. (1964). "Extraversion-Introversion in Experimental Psychology: Examples of Experimental Evidence and their Theoretical Explanations", Journal of Analytical Psychology, 9, 2. ^ Anthony Stevens (1991) On Jung London: Penguin Books, p. 199. ^ C.G. Jung. Psychological Types. Princeton University Press, 1971. pp. 136–147. ^ Stepp, G. "People: Who Needs Them". Vision Journal. Retrieved 19 December 2011. ^ Arild, Sigurd (19 April 2014). "5 Basic Facts about Jung and Types". CelebrityTypes. CelebrityTypes International. p. 1. Retrieved 9 June 2015. ^ Joann S. Lublin, "How to Look and Act Like a Leader", Wall Street Journal, 12 September 2011. ^ Kees van der Pijl, "May 1968 and the Alternative Globalist Movement – Cadre Class Formation and the Transition to Socialism". In: Angelika Ebbinghaus et al. (ed. ), 1968: A View of the Protest Movements 40 Years after, from a Global Perspective. 43rd International Conference of Labour and Social History [de] 2008. Vienna: Akademische Verlagsanstalt, 2009, pp. 192, 193, 194. ^ Dunne, Clare (2002). "Prelude". Carl Jung: Wounded Healer of the Soul: An Illustrated Biography. Continuum International Publishing Group. p. 3. ISBN 978-0-8264-6307-4. ^ Frick, Eckhard; Lautenschlager, Bruno (2007). Auf Unendliches bezogen – Spirituelle Entdeckungen bei C. G. Jung. Munich: Koesel. p. 204. ISBN 978-3-466-36780-1. ^ Wulff, David (1991). Psychology of Religion: Classic and Contemporary Views. Wiley and Sons. p. 464. ISBN 978-0471502364. ^ Levin, Jerome David (1995). "Other Etiological Theories of Alcoholism". Introduction to Alcoholism Counseling. Taylor & Francis. p. 167. ISBN 978-1-56032-358-7. ^ Alcoholics Anonymous World Services, Inc. (1984) Pass It On: The Story of Bill Wilson and How the A.A. Message Reached the World. New York: Alcoholics Anonymous World Services, Inc. ISBN 0-916856-12-7, page. 381–386. ^ a b Carl Gustav Jung (1997). Jung on Synchronicity and the Paranormal. Psychology Press. p. 6. ISBN 978-0-415-15509-0. ^ Carl Gustav Jung (1997). Jung on Synchronicity and the Paranormal. Psychology Press. p. 7. ISBN 978-0-415-15509-0. ^ Nickell, Joe (September 2002). ""Visitations": After-Death Contacts". Skeptical Inquirer. 12 (3). Retrieved 8 August 2018. ^ Michael Shermer; Pat Linse (2002). The Skeptic Encyclopedia of Pseudoscience. ABC-CLIO. pp. 240–241. ISBN 978-1-57607-653-8. ^ C. G. Jung (15 April 2013). Synchronicity: An Acausal Connecting Principle. Routledge. p. 27. ISBN 978-1-134-96845-9. ^ Sullivan, Chalres (August 2009). "Whats Wrong with the I Ching? Ambiguity, Obscurity, and Synchronicity". Skeptical Inquirer. 33 (4). Retrieved 8 August 2018. ^ Jung, C. G. and Wolfgang Pauli, The Interpretation of Nature and Psyche, New York: Pantheon Books, 1955. ^ Chodorow, Joan (1991). "Dance Therapy and Depth Psychology: The Moving Imagination (Paperback) - Routledge". Routledge.com. Retrieved 23 November 2017. ^ Pallaro, Patrizia (15 January 2007). Authentic Movement: Moving the Body, Moving the Self, Being Moved: A Collection of Essays - Volume Two. London: Jessica Kingsley Publishers. p. 33. ISBN 978-1846425868. ^ Jung, Carl (2006). The Undiscovered Self: The Problem of the Individual in Modern Society. New American Library. pp. 15–16. ISBN 978-0-451-21860-5. ^ C. G. Jung, Die Beziehungen zwischen dem Ich und dem Unbewußten, chapter one, second section, 1928. Also, C. G. Jung Aufsätze zur Zeitgeschichte, 1946. Speeches made in 1933 and 1937 are excerpted. ^ Jung, Carl (2006). The Undiscovered Self: The Problem of the Individual in Modern Society. New American Library. p. 14. ISBN 978-0-451-21860-5. ^ a b Jung, Carl (2006). The Undiscovered Self: The Problem of the Individual in Modern Society. New American Library. pp. 23–24. ISBN 978-0-451-21860-5. ^ Jung, Carl (1960). Psychology and Religion. The Vail-Ballou Press ic. p. 59. ISBN 978-0-300-16650-7. ^ Jung, Carl (2006). The Undiscovered Self: The Problem of the Individual in Modern Society. New American Library. p. 23. ISBN 978-0-451-21860-5. ^ Jung, Carl (2006). The Undiscovered Self: The Problem of the Individual in Modern Society. New American Library. p. 25. ISBN 978-0-451-21860-5. ^ Jung, Carl (2006). The Undiscovered Self: The Problem of the Individual in Modern Society. New American Library. p. 24. ISBN 978-0-451-21860-5. ^ Jung, Carl (2006). The Undiscovered Self: The Problem of the Individual in Modern Society. New American Library. p. 14 & 45. ISBN 978-0-451-21860-5. ^ Jaffé, Aniela (1972); From the Life and Work of C. G. Jung; Hodder and Stoughton, London. ISBN 0-340-12515-2; pp. 79–80. ^ An English translation of the circular is in Jung, Carl G. (1970); Collected Works, Volume 10; Routledge and Kegan Paul, London; ISBN 0-7100-1640-9; pp. 545–546. ^ Jaffé, Aniela (1972); From the Life and Work of C. G. Jung; Hodder and Stoughton, London. ISBN 0-340-12515-2; p. 82. ^ Jaffé, Aniela (1972); From the Life and Work of C. G. Jung; Hodder and Stoughton, London. ISBN 0-340-12515-2; p. 80. ^ Mark Medweth. "Jung and the Nazis", in Psybernetika, Winter 1996. ^ Article republished in English in Jung, Carl G. (1970); Collected Works, Volume 10; Routledge and Kegan Paul, London; ISBN 0-7100-1640-9; p. 538. ^ a b Jaffé, Aniela (1972); From the Life and Work of C. G. Jung; Hodder and Stoughton, London. ISBN 0-340-12515-2; p. 83. ^ Noll, Richard (1994). The Jung Cult: Origins of a Charismatic Movement (1st ed.). Princeton University Press. p. 336. ^ Noll, Richard (1994). The Jung Cult: Origins of a Charismatic Movement (1st ed.). Princeton University Press. p. 134. ^ Sherry, Jay (2010). Carl Gustav Jung: Avant-Garde Conservative. Palgrave Macmillan. ^ Jung, Carl G. (1970); Collected Works, Volume 10; Routledge and Kegan Paul, London; ISBN 0-7100-1640-9; p. 185. ^ C. G. Jung Speaking: Interviews and Encounters, eds William McGuire and R. F. C. Hull (London: Thames and Hudson, 1978), pp. 91–93, 115–135, 136–40. ^ Interview with Carol Baumann, published in the Bulletin of Analytical Psychology Club of New York, December 1949. ^ Samuels, Andrew. (1997), Institute of Historical Research, University of London e-seminar.“Jung and Anti-Semitism”, Also published in the Jewish Quarterly, Spring 1994. ^ Dickey, Christopher (12 November 2016). "The Shrink as Secret Agent: Jung, Hitler, and the OSS". The Daily Beast. ^ "Laurens van der Post". Retrieved 2 December 2007. ^ Jones, J.D.F. (2001). Storyteller: The Many Lives of Laurens van der Post. ISBN 978-0-7867-1031-7. ^ Liukkonen, Petri. "Hermann Hesse". Books and Writers (kirjasto.sci.fi). Finland: Kuusankoski Public Library. Archived from the original on 4 December 2007. ^ The World is Made of Glass by Morris West. ^ Birkhäuser, Peter; Marie-Louise von Franz, Eva Wertanschlag and Kaspar Birkhäuser (1980–1991). Light from the Darkness: The Paintings of Peter Birkhäuser. Boston, MA: Birkhäuser Verlag. ISBN 978-3-7643-1190-2. ^ Stockstad, Marilyn (2005). Art History. Upper Saddle River, New Jersey: Pearson Education, Inc. ISBN 978-0-13-145527-6. ^ Grant, Linda (5 June 2003). "History broke Liverpool, and it broke my heart". The Guardian. London. Retrieved 24 February 2010. ^ Cavanagh, Terry (1997). Public sculpture of Liverpool. Liverpool University Press. ISBN 978-0-85323-711-2. Retrieved 23 May 2012. ^ Gualdrón, Andrés, (January 23, 2017). “Spinetta y las criaturas imposibles”. Revista Arcadia. Accessed: November 7th, 2018. ^ "BBC Music - BBC Music, Sgt. Pepper - Meet the Band: Carl Gustav Jung". ^ Bell, Crystal (11 April 2019). "A Map of the Soul: Persona Syllabus To Help Wrap Your Brain Around BTS' New Album". MTV. Retrieved 13 April 2019. ^ Kim, Namjoon. "BTS (방탄소년단) Map of the Soul: 'Persona' Comeback Trailer". Youtube. Big Hit Entertainment. ^ Bondanella, Peter E. (17 January 2002). The Films of Federico Fellini. p. 94. ISBN 978-0-521-57573-7. ^ "BBC interview". 19 February 2011. ^  The Kubrick Site: Full Metal Jacket. ^ Valentine, Digi (13 July 2007). "A Yuji Naka Interview". Nights into Dreams. Sonic Retro. Archived from the original on 24 March 2016. Retrieved 29 November 2015. ^ Jung, Carl Gustav (1984). Dream Analysis: Notes of the Seminar Given in 1928-1930. Princeton University Press. ISBN 978-0691098968. Hoerni, Ulrich; Fischer, Thomas; Kaufmann, Bettina, eds. (2019). The Art of C.G. Jung. W. W. Norton & Company. ISBN 978-0-393-25487-7. Jung, Carl Gustav; Marie-Luise von Franz (1964). Man and His Symbols. Doubleday. ISBN 978-84-493-0161-2. O'Connor, Peter A. (1985). Understanding Jung, understanding yourself. New York, NY: Paulist Press. ISBN 978-0-8091-2799-3. David Bailey's biography of his Great Aunt, Ruth Bailey, ‘The English Woman and C.G.Jung’ drawing extensively on her diaries and correspondence, explores the deep and long-lasting friendship between Ruth, Jung, and Jung's wife and family.